Exotic Anthuruims with delicate soft blue nigella, velvet roses and gyp. Red rose, astrantia, hypericum, and eryguim bouquet was the choice of my bride Vikki. She also had rose buttonholes with some fern and gyp. Congratulations to her and the lucky man who became her husband! The setting was a barn and the style was wild country with a pastel pink colour scheme. Cara chose a pale pink rose and what could be better than the glorious sweet avalanche rose. On the day these roses had opened up amazingly and looked stunning! Cara also had Freesias, Eustoma, Spray roses and buplerum. The bridesmaids had the same but with white roses replacing the pink ones. The mums had pink and white spray rose corsages. The car was packed and ready to deliver jam jars and tea cups of flowers! At the barn there was a plenty of jam jars dotted about in the outside area. And inside candles and tea cups on the top table. Hope Cara and Sean have a great holiday and many happy years of marriage! Katherine and James tied the knot at weston favell in May. Katherines bouquet was a natural colour palette consisting of roses, freesia, gypsopohilia, and rosemary. All the bouquets were finished in a wrap of rustic burlap. The 4 bridesmaids had a simple hand tied gypsophilia bouquet. The buttonholes were a simple single rose with rustic string finish. And to finish the mums had an elegant corsage in neutral colours. And as in every wedding there are plenty of thank you's to be said, so these bouquets were just the job! Congratulations to Annamarie and Izanee who both looked very happy on their special day. 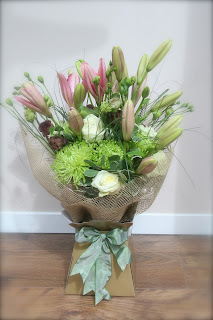 Annamarie chose a beautiful soft bouquet of roses, hydrangea, nigella and gypsophilia. The beautiful bridesmaids held long stemmed roses tied with royal blue ribbon. There was a table top arrangement during the ceremony. This was latter moved to the top table for dinner. 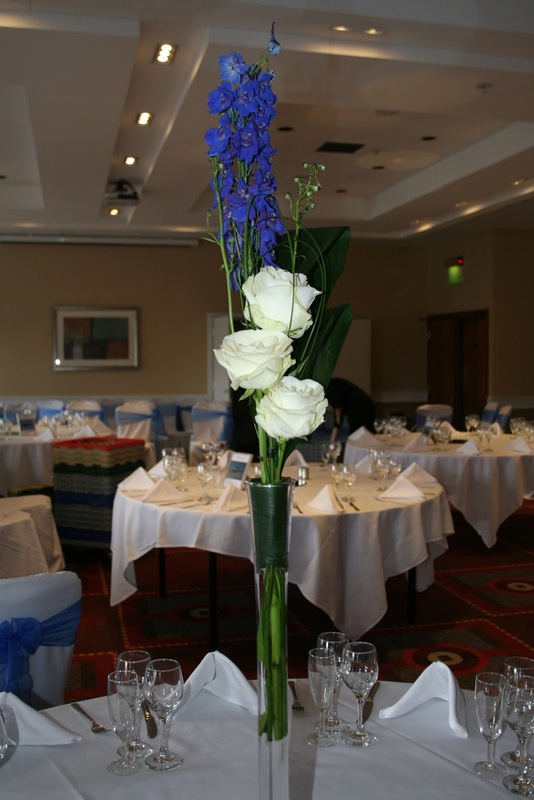 For the table arrangements at the Marriott Annamarie went for simple drama with large avalanche roses and tall delphiniums in slender vases. Congratulations and best wishes to the newly weds.